When you have diabetes, you should have good control of your blood sugar. If your blood sugar is not controlled, serious health problems called complications can happen to your body. Learn how to manage your blood sugar so that you can stay as healthy as possible. Know the basic steps for managing your diabetes. Poorly managed diabetes can lead to many health problems. When you have type 2 diabetes, taking time to plan your meals goes a long way toward controlling your blood sugar and weight. Exercise at least 30 minutes a day, 5 days a week. Do muscle strengthening exercises 2 or more days a week. Avoid sitting for more than 30 minutes at a time. Try speed walking, swimming, or dancing. Pick an activity you enjoy. Always check with your health care provider before starting any new exercise plans. Follow your meal plan. Every meal is an opportunity to make a good choice for your diabetes management. Take your medicines the way your provider recommends. Checking your blood sugar levels often and writing down, or using an app to track the results will tell you how well you are managing your diabetes. Talk to your doctor and diabetes educator about how often you should check your blood sugar. You and your provider should set a target goal for your blood sugar levels for different times during the day. If your blood sugar is higher than your goals for 3 days and you don't know why, call your provider. Random blood sugar values are often not that useful to your provider and this can be frustrating to people with diabetes. Often fewer values with more information (meal description and time, exercise description and time, medication dose and time) related to the blood sugar value are much more useful to help guide medication decisions and dose adjustments. Are You Managing Your Type 2 Diabetes? What can diabetes treatment help you do? The correct answer is all of the above. Managing your diabetes involves keeping your blood sugar at your goal level. This will improve your energy and is the best way to prevent strokes, heart attacks, and health problems such as eye, foot, nerve, and kidney damage diabetes can cause. The correct answer is all of the above. It may take several months to learn the basic skills. Your doctor or diabetes educator can help. Always keep learning about diabetes, its complications, and how to control and live with the disease. Stay up-to-date on new research and treatments. The correct answer is it depends on if your diabetes is controlled. Many people with type 2 diabetes check their blood sugar once or twice a day. If you keep your blood sugar under control, a few times a week may be enough. Ask your doctor what your blood sugar goals should be and how often to test it at home. Your doctor can give you a blood test to check the overall control of your diabetes. The correct answer is true. For most people, the hemoglobin A1c test shows the average level of blood sugar (glucose) over the previous 3 months. It shows how well you are controlling your diabetes. You and your doctor will discuss the correct range for you. For many people the goal is to keep your level at or below 6.5 - 7%. Which situation does NOTrequire you to test your blood sugar more often? The correct answer is taking a nap. All the other situations listed above may affect your blood sugar, so it's best to test more often. 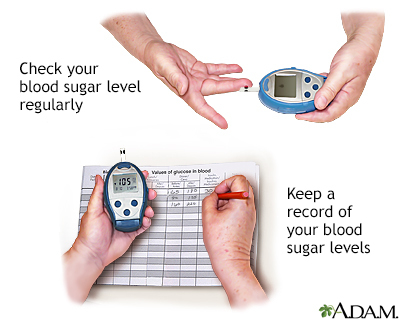 Keep a record of your blood sugar readings and share it with your doctor. This will be a big help if you are having problems controlling your diabetes. How many days should you wait before calling your healthcare provider when your blood sugar level is higher than your goal? The correct answer is 3 straight days. Any number of things can affect your blood sugar, and your health care provider can help you identify what may be causing the problem. The correct answer is all of the above. By testing your blood sugar, you can see how food, activity, or illness affects it. Then you can adjust the foods you eat or your diabetes medicine as needed to help keep your blood sugar at your goal level. Also ask your health care provider which high or low blood sugar readings mean you should call right away. What should your LDL, or bad, cholesterol level be if you don't have any heart problems? The correct answer is 100 mg/dL. Managing your cholesterol can help you prevent heart disease, stroke, and kidney damage. Most people with diabetes should keep their LDL below 100 mg/dL. If you already have heart disease, the lower target of 70 mg/dL may be better. Ask your doctor what your LDL target is. Also learn how to shop for and cook foods that are low in fat and healthy for your heart. Which is a good blood pressure goal for most people with diabetes? The correct answer is lower than 140/80 mm/Hg. If your blood pressure is 140/80 mm/Hg or above, your doctor may want to prescribe medicine to help you lower it. Some people with diabetes may have a lower blood pressure target such as 130/80 mm/Hg. Check with your doctor to see what your blood pressure target is. The correct answer is getting a monthly pedicure. Only trained healthcare providers should care for your feet if you have diabetes. Caring for your feet is an important part of managing diabetes. So be sure to tell your doctor if you notice a cut, ingrown toenail, or break in the skin. If you have diabetes, how often should you see your doctor? The correct answer is every 3 to 6 months. You should also see your dentist every 6 months and your eye doctor once a year. Stay in close contact with your health care providers. That way, any minor health problems get treated quickly before possibly becoming more serious. For people with type 2 diabetes, the American Diabetes Association also recommends that blood sugar targets be individualized. Talk to your doctor and diabetes educator about your goals. Has your provider (or insurance company) changed your medicines? If you take insulin, have you been taking the correct dose? Are you changing your syringes or pen needles? Have you injected insulin into a firm, numb, bumpy, or overused area? Have you been rotating sites? Have you had more stress than usual? Call your provider if your blood sugar is too high or too low and you do not understand why. When your blood sugar is in your target range, you will feel better and your health will be better. Dungan KM. Management of type 2 diabetes mellitus. In: Jameson JL, De Groot LJ, de Kretser DM, et al, eds. Endocrinology: Adult and Pediatric. 7th ed. Philadelphia, PA: Elsevier Saunders; 2016:chap 48. A person with diabetes constantly manages their blood's sugar (glucose) levels. 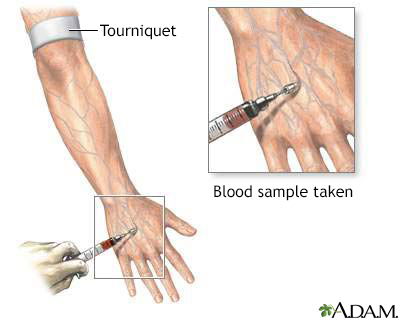 After a blood sample is taken and tested, it is determined whether the glucose levels are low or high. If glucose levels are too low carbohydrates are ingested. 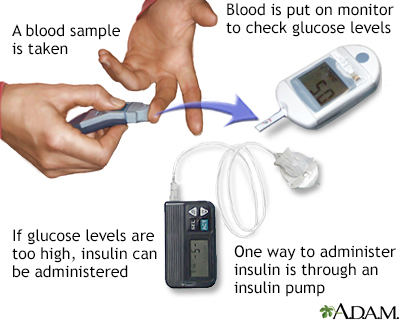 If glucose in the blood is too high, the appropriate amount of insulin is administered into the body such as through an insulin pump.